It’s here! Jelly Toast’s fancy re-design is here and I couldn’t be more thrilled. On top of the new design, it’s also Friday so we get to celebrate with a cocktail. Win win. Now only if we could make the cocktail into a t-shirt, we’d be in serious business. Anyway. 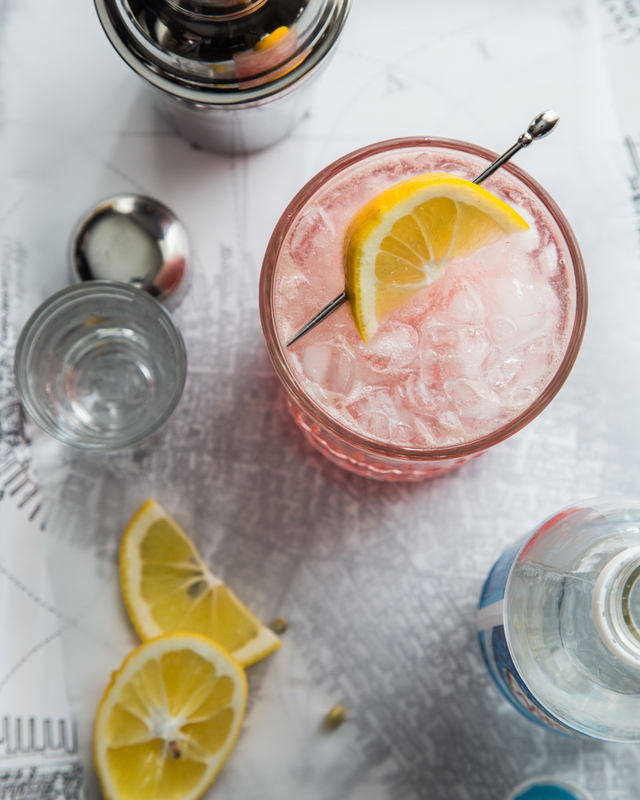 I was considering doing a separate post where I walk you around all the new features of the site to point things out, but decided to just show you the new things while simultaneously enjoying this beautiful Meyer Lemon Raspberry Fizz. I think you’ll agree that this is one celebratory cocktail and worthy of sharing the first full day in this new space. I have Lindsay from Purr Design to thank for this gorgeous makeover. The thing about Lindsay is that she is incredibly patient and knowledgable, even when on the receiving end of my rapid fire emails about questions and ideas I have about the new site. She took on this project, with all of my loose end ideas, and tied them all together to create this look of clean simplicity, that is actually anything but simple. I asked her to make the images on Jelly Toast as big as she possibly could and she did just that. I’m loving the new huge images and it will make me work even harder as photographer to give you the prettiest photos I can. Structure wise, there weren’t a ton of visible changes, however, she did a serious magic act behind the scenes of Jelly Toast. Now I can navigate with ease and the ability to avoid the panic at 10:30pm when a bit of code mysteriously disappears. Code can be pesky like that. Lindsay made sure that code would stay organized and in it’s place. Besides the complete makeover on style (hello new header!) Jelly Toast has a great new visual recipe index to help you find all of the recipes you might be looking for. You can click at the top of the page where it says recipe index or at the bottom of the page. All of the recipes are sorted by category and ingredient. Fancy, huh? Plus, there are some nice big buttons for some of my most popular recipe categories along the side bar: breakfast, cocktails and dessert. I even took some time to update my terribly outdated About page. Oy, that thing was old. Also, I’m still smack in the middle of the most frustratingly slow hair style grow out of my life and as soon as I become presentable, I’m going to update that headshot. My goal is a mid length style with bangs. Thoughts? Another new feature is a link to my new (and still a work in progress) photography portfolio (see the top menu bar: photography). I’ve had the pleasure of taking on quite a few photography projects outside of Jelly Toast and am continuing to grow that aspect of what I do. A separate photography portfolio will allow me to share all of my work, regardless if it is commissioned project, blog post, or personal project. Be sure to check it out and I’d love to hear your thoughts! Anywho, I am so giddy about the new design I whipped up this Meyer Lemon Raspberry Fizz which was one of our weekend rolls of our Foodie Dice. If you missed last week’s Rum Orange Swizzle you need to check it out and hear all about my favorite mixology tool. These things are amazing! We chose to roll for a Fizz and we ended up with vodka, jam/preserves, maraschino liqueur, and lemon. Well, I had just picked up a bag of Meyer lemons and figured they would be delicious with some raspberry preserves. I decided on the raspberry because that was all we had left in the fridge, so options were limited. Either way, the combination was fabulous. Plus, it turned out this crazy blushing pink making it a stunner of a drink. Valentine’s Day cocktail, anyone? According to the dice, a fizz has the option of having an egg white in it that creates an amazing foam. I love that, however, we didn’t have any pasteurized eggs on hand, so we skipped it this time. It was fabulous without it! Fill a cocktail shaker with ice. Add vodka, raspberry jam, maraschino liqueur and Meyer lemon juice. Shake rhythmically for 30 seconds. Double strain (using the built in cocktail strainer as well as a fine mesh strainer) into an ice filled highball glass. Top with club soda. Enjoy! Beautiful redesign! It’s so fresh and clean and really highlights your gorgeous photography. Well done, Lindsay (and you :))! Thanks, Stephanie! Lindsay did such an awesome job – I couldn’t be happier! 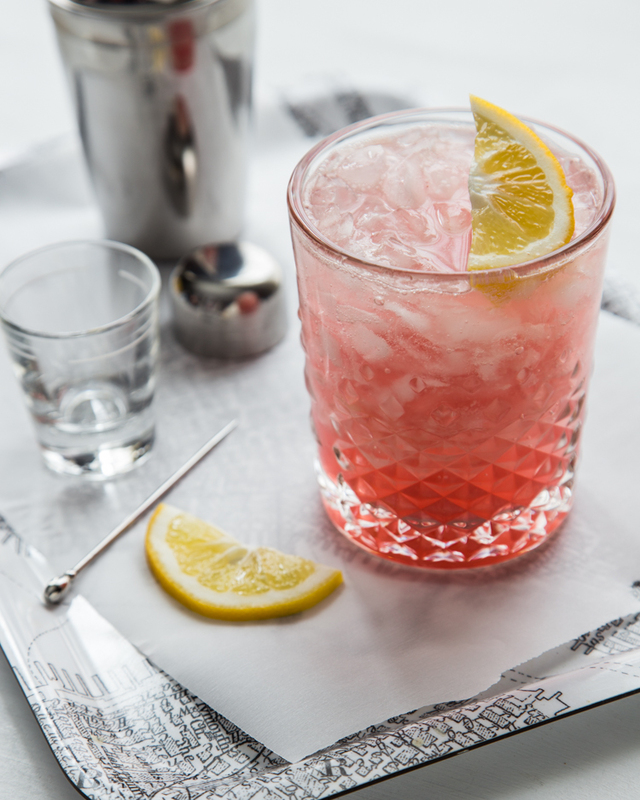 What a beautiful cocktail to toast your new look — I love the bold clean look of it, great job! Love the re design girl and I especially love this cocktail too! Such a gorgeous colour! This looks really good and I love your blog! I was just wondering if there was a way to make this without the alcohol. Thanks! Hi Olivia! Thank you!! 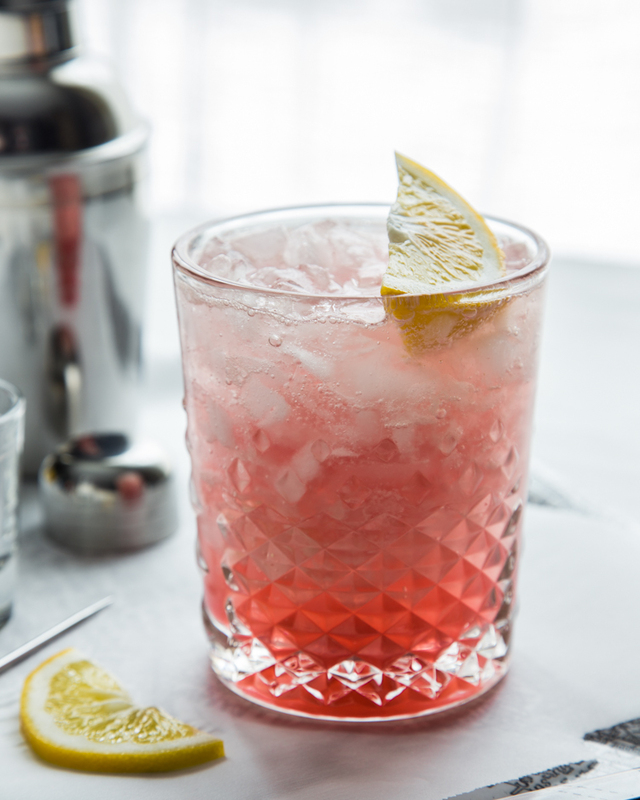 I’ve been thinking about this, and I think if you combined a glass of lemonade with a small spoon of raspberry jam, shook it or stirred it, then topped it off with club soda or sprite, it would be delicious! Love the new look!! The pictures a huge and absolutely stunning. Love the little “pin” button that swoops in, at the ready. Simply beautiful from start to finish. I also can’t even imagine your with mid-length hair and bangs since I’ve only ever seen you with short hair but I cannot wait to see how it looks! Adorable, I’m sure 😉 I’ve considered briefly growing my hair back out but it’s SO short right now, I can’t even imagine the time and awkwardness of the whole process so for now I’m sticking with the short. On another note, this cocktail?? Gotta make it. Yum! I love your clean new look and this fizz is just the prettiest! Gorgeous site! Nice and clean… and easy to navigate. The drink looks delicious- love a good fizz cocktail!